3 components of the current banking framework have been presented as the main root of the systemic breakdown we have seen in last months. (We only looked at 3, I do not think they are necessarily the main ones…. We just decided 2 were out of scope, because not directly related to banking, so we cut out all references to global savings changes/macro economic factors and to market regulation- fundamentally, those are probably the main root) The first section is addresses the question of banking regulation and tries to establish the future trends of the reshaping of this important pillar in the banking framework. The second section looks at the changes in the complexity of banking products and looks at the impact on the crisis of this component. The third component we would like to address is changes of the banking structure in the last years. These changes had a important impact as a cause of current events. This point has been addressed in the section 3. 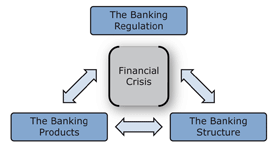 The banking regulation model : Basel 2- an imperfect model ? The banking regulation model has been clearly failed to guide banks in a way which protects depositers and economic and financial stability. Two points have been discussed : the first one is related to the Basel 2 framework. Why this new regulation framework did not succeed in preventing systemic risk ? The crisis has demonstrated weakness in the and we will look 2 main failiures.. The second point is related to the new architecture of European regulation and the cooperation in the euro zone. Importance of rating in the Basel 2 framework Ratings and how to treat credit derivatives were the main talking point in the Basle 2 negotiations. The Standard approach is based on external ratings : Ratings became more important as a way of determining asset quality, whether external or internal. Recently CDO based on average quality US mortgage debt was trading at 20 cents to the dollar (actual default level less than 5 %), but there are still not many buyers…. they fear ending up as house owners instead of bond owners. The future of regulation : integration or better coordination in euro zone ? The crisis has a huge impact on the political awareness for a need of regulation at the european level. The next months will play a major role in choosing the way of integration (one common regulator with the same architecture as ECB) or the way of more coordination between the local authorities. NGR Consulting will watch the evolution of this situation carefully. The possible use of new products as a risk mitigation tool has produced an increasing development of such products- notably the development of the CDS market. Credit default swaps consist of swaping the credit risk of the issuer of a security for the credit risk of the swap seller. Basel 2 acepts CDS as a tool of risk mitigation. • Much more liquid market for managing risk With Basel 2 banks the notion of collaterization of debt with assets was widened. Typical examples are • Mortgage loans • Synthetic collateral packages • Ship and aircraft finance • Novation netting • Offsetting counterparty risk positions • Settlement netting • Though not rewarded by reduced capital adequacy requirements, treated and column 2 But Credit risk insurance does not protect against systemic risk : If all CDS are called because of general down-grading, the existence of the seller may be threatened – see AIG. Cover is generally not complete. The idea of having covered risk brings with it a moral hazard of bad lending practices. Selling cover for high rated borrowers is easy money, but the risk position needs to be managed. If the position held is larger than the total volume of underlying, this may be impossible. A haircut will not protect, if the asset is so illiquid it cannot be sold. In a liquidity-crunch, there is a qualitative change in the nature of the problem. In a larger sense this is the point where banking regulation becomes market supervision. Therefore, The future accord will need to better take into account the notion and impact of liquidity on valuation of such products. As savings have increasingly been routed to investment funds, asset managershave professionalized savings management. Asset managers demand more performance from bank management and improved return on equity in a way savings account holders never did. At the other end of the product chain long-term relationship banking with long term loans has increasingly been replaces by managing securitized debt issues. Glass-Steagall –Act 1929- prevented banks in the US from underwriting securities and taking securities. Private Banks in Europe and UK (Rothschild, Warburg, Schroeder etc) playing the same role as investment banks in the US. Many brokers and investment banks merged or integrated upstream (Merrill-Lynch) or downstream (Lehman Koeb) in the last 25 years. With the repealed of The Glass-Steagall Act in 1980, a period of deregulation of US banking started with investment banks having elements of commercial and private banks (wealth and asset management). Commercial banks also moved into investment banking activities as intermediaries, underwriters and deal-makers – becoming themselves engines of designing and introducing new products. Now there is no longer strict legal delimitation of investment banking. Investment banks- a role model for commercial banks ? The model for many commercial banks has become closer to that of investment banks as an intermediary and deal-maker, as an engine for designing and introducing new products. Derivatives have been increasing used as a risk management tool or simply for profit generation. Managing capital adequacy has meant concentrating on fee generation on off-balance activity. Conclusion : What impacts will the present crisis have ? Even if we saw some trends in solving issues and prevent the same situation in the future, Some questions are still open : Nationalizing debt- Can private debt be managed by the private sector ? Regulation to protect borrowers ? Must the governments regulate more ? Can the central banks better regulate market conditions ? Re-vamped liquidity ratios ? Less interest in an international level playing field- more national regulation ? No Basle 3 ? How good are ratings as a way of measuring risk anyway ? Funds as deposit takers and traders- hedge funds the new investment banks ?Banks and own-book trading, too tempting to ignore. Some commercial banks will always move in this direction, even if they get into business areas they do not understand well. Funds and issuers still need broker services, the role for investment banks continues, even if they have now virtually disappeared in their earlier form. Within our professional researches activities, it will be interesting for the next months to analyse the trends and developments.